Persil Liquid Non Bio is tough on stains and gentle next to skin. This Persil non bio detergent is approved by the British Skin Foundation and dermatologically tested. 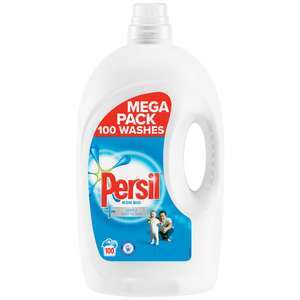 The Persil liquid works efficiently at lower temperatures and comes in an easy pour bottle. If anyone has the bounty app, there’s a £2 off voucher if you purchase any persil non bio and comfort pure together. Got comfort pure for £2.50 which was half price in Tesco and persil non bio 60 washes for £6. Saved £2 so got it all for £6.50 voucher only valid in Tesco. Smaller packaging so takes less space? Donkey of the day goes to coconut38! Smaller packaging so takes less space? Donkey of the day goes to coconut38! Liquid detergent never gonna do number of washes quoted - most just slosh it in . Liquid detergent never gonna do number of washes quoted - most just slosh …Liquid detergent never gonna do number of washes quoted - most just slosh it in . It will if you use the correct dose! Thanks for posting, OP. Heat added.